The Aboard OSHA-GHS Compliance Software (OGCS) generates standardized OSHA-GHS Labels and key OSHA-GHS SDS (Safety Data Sheet) sub chapters that describe the hazards associated with each item sold. The calculations of the hazards associated with each product are based on the hazards of the components of the product at all levels, through the calculation of the concentration of every component in the final product, and associating the hazards of the components to the final products by following the OSHA-GHS rules about hazard propagation depending on component concentration. The system provides a user-extensible database preloaded with the most common CAS Numbers (component identification numbers) which the users can search to assign their CAS Numbers to the basic components, when those CAS Numbers are not provided by the vendor of the component products. Then for each finished product the system searches down the tree of multiple levels of bills of materials to find out all the basic components of a product, and calculates the concentrations of each component in the final product. Finally, based on those concentrations and on the mandated hazard propagation rules of each CAS Number, the system assigns a set of CAS Numbers to the finished product. 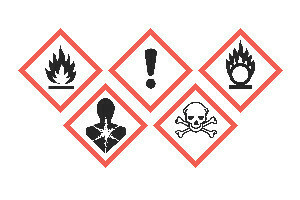 The CAS Numbers in that set determine the hazard pictograms and the hazard statements that the product label must include. A label is then generated and can be printed as needed from the system. Also, the key sections of the mandated SDS are generated so the user can copy/paste them into the SDS document for the product.